More than 1,000 demonstrators protesting a variety of causes—police shootings, global warming, low wages, opposition to the Dakota Access Pipeline—march through the streets of San Diego on Nov. 29, 2016. When Bloomberg Media convened an invitation-only forum of notables on “The Future of Climate Change” during the first weekday of the Democratic National Convention in Philadelphia last summer, there was only one black person at the table. When that person, economist Julianne Malveaux, finally asked what that event’s cross section of environmentalist elite were doing about the disproportionate impact of climate disaster on black people, the reaction was quizzically tense. “But, well, what do you recommend we do?” was the response from one white woman, who seemed to pose it more as a challenge than a question. And when the other black person in the room (a silent observer for the only two black media outlets present) suggested that they could start by purchasing ads in black newspapers—such as the big daily one in Philly—the room was dumbfounded for a few seconds. The exchange captures the level of diversity in the mainstream environmental movement: that is, not much. Instead, it’s unrepentantly white. Green activism is a massive nonprofit industry with green-economy market potential, but it’s constantly shaped by white voices: a national “green conversation” unfairly bathed in the stereotype of long-haired, tree-hugging white college kids road-tripping from one protest to the next. Blame falls mostly on the movement itself. While the recent stand by indigenous tribes at the Dakota Access Pipeline site in North Dakota might have briefly changed perceptions of the popular green movement’s complexion, it didn’t fix the broader problem of a space stubbornly dominated by white faces. Impending policy fistfights over climate change are already rattling Washington, D.C., as a climate-change-denying Trump administration takes over. There are signs that the Trump White House, with congressional Republicans, will gleefully roll back hard-fought progress on climate change and air and water issues. But the open battle over national environmental policy—certain to hog up many headlines over the next few years—will find black voters, advocates and politicians largely absent. Lead environmental advocacy organizations from the Environmental Defense Fund to billionaire Tom Steyer’s hyped NextGen Climate PAC are overwhelmingly white either in their staff makeup or in their leadership. “Without people of color in positions with policymaking capacity, it means that the perspectives of people of color are less likely to be included in the deliberations or outcomes,” Tome noted. Yet, when human-made or human-instigated disasters inevitably hit, black folks are on the front lines. Bad water in Flint, Mich. Lead poisoning in an East Chicago project. Historic flash flooding in Baton Rouge, La. Superstorms along the Northeast. City-flattening hurricanes in New Orleans. That’s a hard ask when people-of-color interns in environmentally focused nongovernmental organizations, government agencies and foundations outnumber the few people of color in leadership and board slots by a factor of two or three. Fewer of those people of color represent the black Diaspora, much less African Americans. Politically, it’s bad enough that black elected officials—especially on the federal level—won’t jump in on climate talk. But when environmental organizations need to change the electoral map, black candidates don’t get checks, and black voters are lucky to get noticed. Even NextGen Climate couldn’t say for certain whether any of its $6.8 million media ad buy was dropped into black media outlets during the 2016 election cycle. One black advocacy group, Color of Change, did receive $74,000 (out of $92 million spent), but NextGen simply outsourced black outreach through a $5 million partnership with big labor’s Service Employees International Union. Still, a finger bow to NextGen for the effort: It was better than other green political titans like the Environmental Defense Fund, which didn’t bother giving any money to black House or Senate candidates this past election cycle. Funny, though: It’s not as if black people don’t care about climate change (even though they don’t talk it up enough). As a matter of fact, they do: Roughly “three in five rate global warming and air pollution as serious problems,” according to a 2015 Green for All poll (pdf). Nor is it that there aren't black voices lighting up the talk on climate change and other green topics—in fact, there are quite a few. Topping most lists of notable black greens is Van Jones, the once-estranged Obama White House point man on green issues, now of CNN fame, who heads up Green for All. NAACP Environmental and Climate Justice Director Jacqui Patterson led an unofficial delegation of color to the 2015 Paris Climate Summit and demanded that the U.S. government pony up $5 billion for a Green Climate Fund. 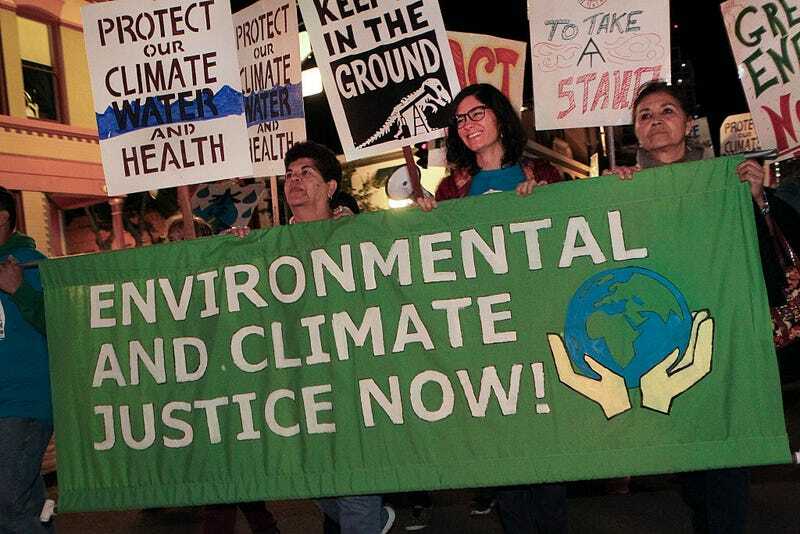 But there are scores of others who have long been in the streets either creating movements, like environmental-justice “father” Robert Bullard, or carrying green flags and studying climate trends, like J. Marshall Shepherd at the University of Georgia and “urban scientist” DNLee. Brentin Mock, justice editor at must-read enviro mag The Grist, roundly schooled this writer about the black folks shaking up the climate debate. And the Kresge Foundation-funded Urban Resilience Project touts an impressive pool of black minds on the subject, from Danielle Hilton and Seandra Pope down South to the Los Angeles County Bicycle Coalition’s Tamika Butler out West. Obviously we can’t name every black environmentalist on climate duty, but operations like Kresge are funding a hard push to help us find more. That's resulted in efforts like Green 2.0 (and those groundbreaking diversity reports) to supporting the Building Equity and Alignment Initiative, another effort encouraging links among big greens, the grass roots and philanthropic organizations, as well as partnerships with groups like Sierra Club, 350.org and the Union of Concerned Scientists. Still, LACBC’s Butler looks for answers from the black and brown leaders of environmental-justice outfits rather than blank stares from the “mainstream” ones.